During this year’s SATELLITE 2018 Conference and Exhibition, Orbital ATK, a leader in the emerging space logistics market, debuted the next generation of in-orbit satellite serving technology with the introduction of Mission Extension Pods (MEPs)™ and the Mission Robotic Vehicle (MRV)™. 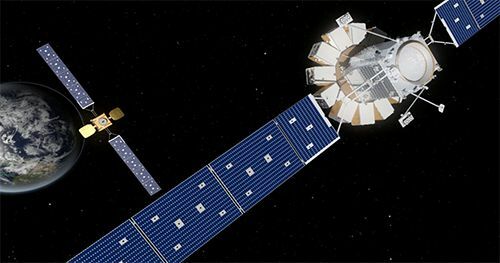 These two products join Orbital ATK's Mission Extension Vehicle (MEV)™, creating a suite of in-orbit satellite servicing products focused on extending the life of existing satellites. Artist's rendering of a MRV carrying MEPs (right) approaching a client satellite (left). 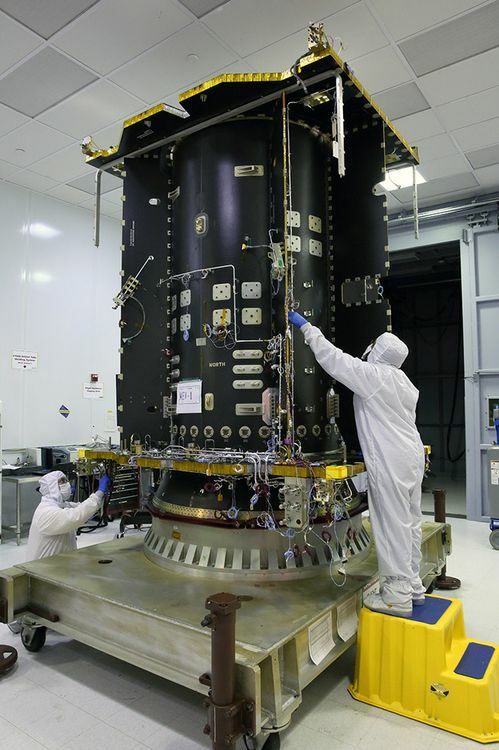 This new system provides customers with more flexibility to extend the life and effect repairs to their valuable in-orbit satellite assets. The MEP is an external propulsion module that attaches to and provides up to five years of orbital life extension for aging satellites which are running low on fuel, but are otherwise healthy. The installation is low risk, and the customer remains in full control of their satellite before, during and after the process. While the primary application of the MRV is to transport and install MEPs or other payloads on customer satellites, it will also offer space robotic capabilities for in-orbit repairs and similar functions. SpaceLogistics, a wholly owned subsidiary of Orbital ATK, is now offering this innovative system with launch scheduled for 2021. “The introduction of MEPs allows us to offer a complementary service alongside our MEVs to meet the industry’s needs by providing low-risk, low-cost station-keeping for geosynchronous satellites of all types,” said Tom Wilson, President of SpaceLogistics. “We always aimed to expand our fleet to provide a wide variety of space logistics services, and the MEV, MEP and MRV products give our customers the option to select exactly the kind of life extension or in-space repair they may need." The MEV-1 core currently in production at Orbital ATK's Dulles, Virginia, facility. Both new products leverage the design of Orbital ATK’s MEV. The company continues to make forward progress on the production of its first two MEVs. MEV-1 is scheduled to launch in late 2018, and MEV-2 is targeted for lift off in early 2020. Each MEV has a 15 year design life with the ability to perform numerous dockings and services during its life span. Intelsat is the initial customer for the first two MEVs. The MEV, MEPs and MRV are part of SpaceLogistics longer-range plan to establish a product line of in-orbit servicing vehicles that can address diverse space logistics needs including repair, assembly, and through-space transportation. The company is also working with U.S. government agencies to develop and implement new capabilities into the MEV fleet. These include next generation life extension and repair vehicles, in-orbit assembly of large space structures and cargo delivery and logistics services to deep space gateways in Lunar and Martian orbits.